Biosensors have captured the imagination of the world's scientific and commercial communities by combining interdisciplinary skills of biologists, physicists, chemists and engineers to provide innovative solutions to analytical problems. Biosensors are applicable to clinical diagnostics, food analysis, cell culture monitoring, environmental control and various military situations. Ever increasing demands for rapid and convenient analyses of a wide variety of materials in diverse locations has led to intense interest in the fusion of biology and electronics which mimics our principal concern: the effect of materials and environments on living systems. 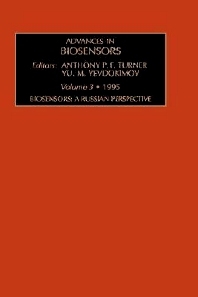 This series, "Advances in Biosensors", presents a compendium of research papers, in which authorities in the field of biosensors provide an up-to-date overview of their laboratory's contribution, summarizing the primary research as it has appeared, possibly scattered, in the journal and conference literature, and reflecting on their findings. The net result will be intense, yet highly readable accounts of the state of the art at this leading edge of analytical technology. Reinhard Renneberg received his PhD at Central Institute of Molecular Biology, Berlin, German Democratic Republic in 1979. Since 1995 Professor Renneberg has been heading the Biosensor group at the Department of Chemistry of the Hong Kong University of Science and Technology. He is an expert in biotests, biosensors and signal amplification technologies. Dr. Renneberg is also the inventor of Cardiodetect, a rapid fatty acid-binding protein (FABP) immunotest which allows diagnosis or exclusion of acute myocardial infarction within half an hour after the onset of symptom and of InfectCheck, a barcode-style lateral flow assay for semi-quantitative detection of C-reactive protein (CRP) in distinguishing between bacterial and viral infections. Dr. Renneberg is the author of several books on biotechnology, including the award-winning textbook Biotechnology for Beginners which the university includes in many of its training packages. He advises a wide range of biotechnology companies as expert content provider, pedagogical expert and top-level academic relay for biotechnology education.